Most theme parks strive to create the illusion of danger, but at New Jersey's Action Park the dangers were all too real. In the tradition of Bad Grandpa, Johnny Knoxville’s forthcoming film, Action Point, finds a fictional context to wrap around Jackass type stunts. Knoxville plays D.C. owner of Action Point -- a low-rent, out-of-control amusement park where the rides are designed with minimum safety for maximum fun. Just as his estranged daughter Boogie comes to visit, a corporate mega-park opens nearby and jeopardizes the future of Action Point. To save his beloved park and his relationship with Boogie, D.C. and his loony crew of misfits must risk everything to pull out all the stops and save the day. 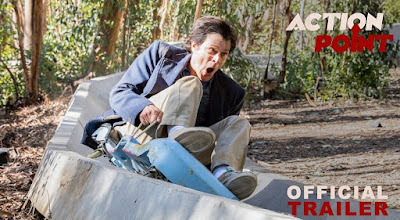 Action Point hits theaters on June 1, 2018.